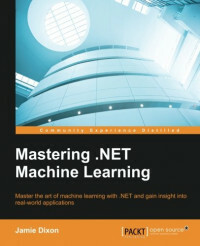 This book is targeted at .NET developers who want to build complex machine learning systems. Some basic understanding of data science is required. .NET is one of the widely used platforms for developing applications. With the meteoric rise of machine learning, developers are now keen on finding out how to make their .NET applications smarter using machine learning. Mastering .NET Machine Learning is packed with real-world examples to explain how to easily use machine learning techniques in your business applications. You will begin with an introduction to F# and prepare yourselves for machine learning using the .NET Framework. You will then learn how to write a simple linear regression model and, forming a base with the regression model, you will start using machine learning libraries available in .NET Framework such as Math.NET, numl, and Accord.NET with examples. Next, you are going to take a deep dive into obtaining, cleaning, and organizing your data. You will learn the implementation of k-means and PCA using Accord.NET and numl libraries. You will be using Neural Networks, AzureML, and Accord.NET to transform your application into a hybrid scientific application. You will also see how to deal with very large datasets using MBrace and deploy machine learning models to IoT devices so that the machine can learn and adapt on the fly.